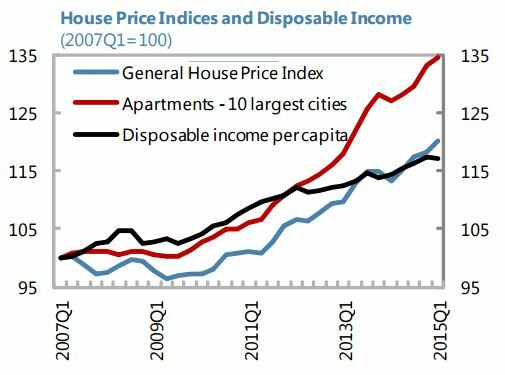 “The moderate upward trend in housing prices continues and the appropriate response at this stage is close monitoring and readying the macroprudential toolkit. After years of stagnation, nominal housing prices at the aggregate level have grown at an annual pace of 3–4 percent for the past five years—only marginally faster than the growth in disposable income. In spite of falling lending rates, mortgage loan growth remains modest and lending standards appear stable. Thus, there are no signs of overheating yet. Nonetheless, developments in the most dynamic segments, such as apartments in large cities, deserve particular supervisory attention, and efforts to step up data collection on mortgage loan terms and conditions need to continue, including because of a significant share of high reported loan-to-value ratios (LTVs) in those segments in a recent Bundesbank survey. Last December, the Financial Stability Committee (FSC) announced that it was examining an expansion of the German macroprudential toolkit, as recommended by the FSB and the Fund last year. Introducing instruments constraining mortgage loan eligibility, such as loan-tovalue and debt-service-to-income limits, would be very helpful, not only because they might be needed in the future, but also because of the signaling value of this policy decision. A carefully designed communication strategy would help make the most of this signaling value,” according to the latest IMF report on Germany.